Pastel colors (the underwear palette) and Monet’s gardens: what could be more innocuous elements from which to construct a body of work? Surprisingly, in The Tragedy of the Enclosure currently on view at Austin’s MASS Gallery, Los-Angeles-based David Prince weaves these seemingly innocuous referents into a meditative, touching installation on the fragile and fuzzy construct of “nature,” in which ideas fueling the work do not prevent sensory access to it. 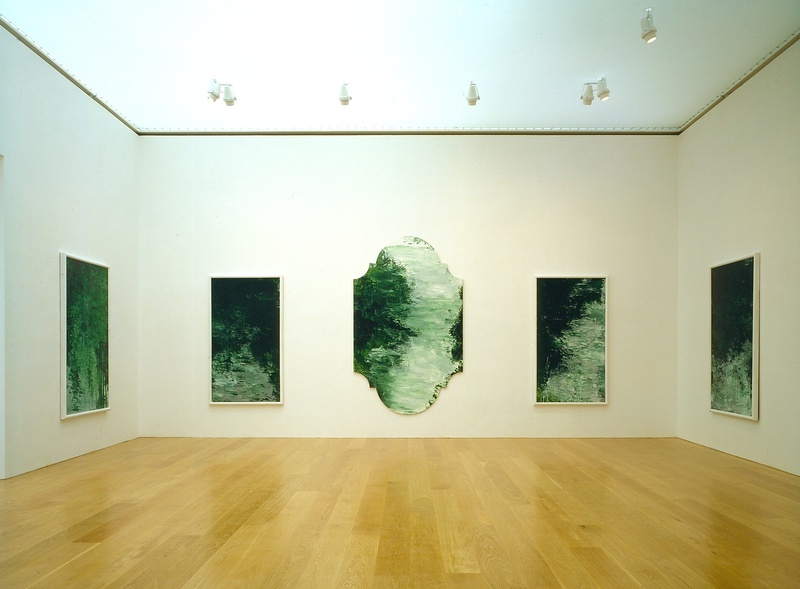 Perhaps the last “serious” attempt to channel Monet were Cy Twombly’s untitled “green paintings” shown at the 1988 Venice Biennale, and now on permanent display at the Menil Collection in Houston, but they were done more than twenty years ago and by the artist with a generational license and gestural pizzazz to execute them. Twombly replaced Monet’s shimmering chromatic range for a narrow palette of somber, murky greens and, through the use of shaped canvases, spiced his work up with an art-historical reference to the Venetian Rococo, as if to make clear that his paintings were explicitly about painting. Today, non-ironic pastel colors and Monet’s gardens belong to the repertoire of Sunday-continuing-education students who try to use them for their “art” while their MFA-educated, post-conceptual, post-studio instructors struggle to provide some sort of feedback. In many ways, Prince draws from the common lexicon of artistic production of his generation: a large-scale wall drawing, videos, photographs, ceramic and found-object sculptures that nod to the quotidian and banal. A visitor to the gallery is welcomed by an oversized lampshade-like sculpture made of palm fronds painted in pastel shades of yellow, orange, green, blue, and purple. When I walked into the space on warm Sunday afternoon, it was an eye-catcher, slowly rotating in the breeze from the open door. This delicate color palette and the combination of natural with unnatural organize the show: from the glazed earthenware pineapple and the pile of palm-frond slices stacked intermittently with cleaning pads, to the large Sharpie drawing of tree rings in the main gallery and the arrangement of orange and pinkish everyday items in the corner of the gallery’s second space. Repetitions and inversions are important to the configuration of the exhibition, too. The dark ceramic Globe No. 5 on the shelf next to the gallery’s main entrance has its almost-twin counterpart, Globe No. 1, on the floor in the corner of the second gallery. In the center of the main space the palm-frond sculpture hangs from the ceiling; in the center of the second space a contellation-model-like sculpture of Play-Doh and twisted tomato cage wire sits on a formless plaster pedestal on the floor. The pastel tones are not only the colors of the plastics, marking the unnatural elements of the show, but are also the colors of the blooming flowers in a dozen photographic prints from the series Monet Garden Compositions, displayed mostly in the second gallery. Photographed at dusk, these flowers emerge as subtly colored specks that seem to glow and shimmer against their dark, dense backgrounds. One can almost mistake these prints for light boxes as the effect of their inner luminosity is heightened by the combination of black borders, highly reflective glass, and deep frames. As a result, the flower arrangements take on the appearance of stellar constellations captured against the infinity of space. The gallery’s write-up compares them to “a secret garden which is bound by walls, but internally expansive.” Prince brings the title word of the exhibition, “enclosure,” literally into these works by framing his modestly-scaled prints (one could say “easel-painting-size”) in raw planks of wood, apparently the fencing from his own backyard. This is where the bookish reference comes into play since the title of the exhibition is the spin on the 1968 influential article by ecologist Garret Hardin, The Tragedy of the Commons. However, even without it, Prince’s works themselves contain fairly clear clues to possible readings, including—perhaps—meditations of ecology and our relationship to nature. At the same time, the quiet allure of his works and their deliberate organization into a coherent larger system prevent them from being post-conceptual one-line puns. With their direct hints to clearly recognizable, nameable phenomena, Prince’s photographs and sculptures are also radically different from the design aesthetic of, for example, immensely popular Tauba Auerbach, whose conceptual sophistication can only be discerned with the artist statement in hand—that is, the kind of work that in itself comes across as a perfectly polite and sellable variation on the perennial monochrome. What I am trying to get at while thinking through David Prince’s work are the criteria that we use to evaluate contemporary artwork in general, which seem to play out, even if only covertly, in the endless battle between polar opposites: low-brow vs. high-brow, populist vs. elite, political vs. aesthetic, social content vs. formal innovation, and so on. Every critic appears to pick their own poison. Here, I am especially thinking about Donald Judd’s distinction between direct and indirect art, rehashed not long ago by art historian (and my former professor) David Raskin at the symposium Minimalism Now at the Renaissance Society. According to this particular binary pair in Raskin’s interpretation, art that creates direct phenomenological experience through its internal structure and art that is “clever”—that is, comments on or points to something else—are irreconcilable opposites. But David Prince’s work easily proves you can have it both ways. The Tragedy of the Enclosure is on view through February 15, 2014, at MASS Gallery (507 Calles Street, Suite 108), Austin, TX. The gallery is open on Fridays, 5–8 pm, Saturdays and Sundays, noon–5 pm, and by appointment. Most images courtesy of the artist and MASS Gallery. A couple of installation shots are by me.